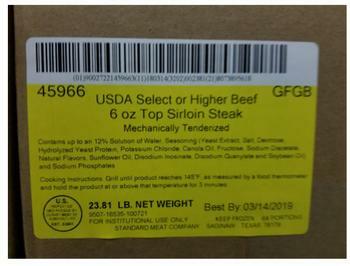 Standard Meat Company of Saginaw, Texas, is recalling up to 53,154 pounds of raw beef sirloin that may be contaminated with Salmonella. Approximate 20-lb. boxes containing “USDA Select or Higher Beef 6 oz Top Sirloin Steak Mechanically Tenderized” with case code 45966. Approximate 30-lb. boxes containing “USDA Select or Higher Beef 8 oz Top Sirloin Steak Mechanically Tenderized” with case code 45968. The recalled products, bearing establishment number “EST. 33861” inside the USDA mark of inspection, were shipped to restaurants nationwide. Consumers with questions regarding the recall may contact Joe Brhlik at (866) 859-6313.